Ahh Paris! I love Paris dearly. The history, the cultural achievements, and the setting all come together here to wow you almost constantly. We did catch some rain here, but there was enough things to do inside that we didn't feel we missed out. 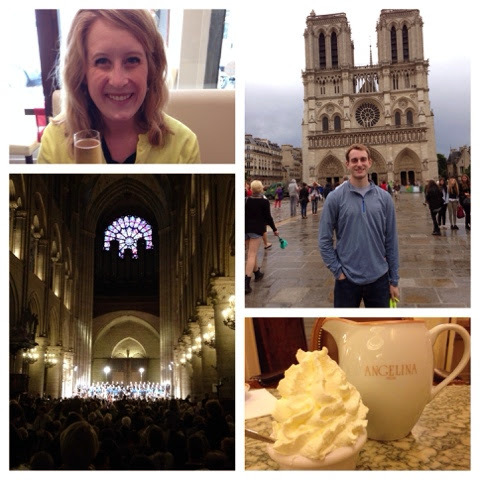 Matt and I were on our feet here a ton---we walked everywhere and I believe that its the perfect way to see Paris. The hostel reviews for Paris online were pretty mediocre, so for Paris we moved our search to 1-2 star hotels. I happened upon Hotel Stella in the 5th arrondissement (very close to where Hemingway lived). It is owned by a nice lady who has multiple pets. If you're looking for a cheap place to stay in Paris that isn't in a sketchy neighborhood--here is the place. It's got a lot of historic charm, but it also just felt old too. 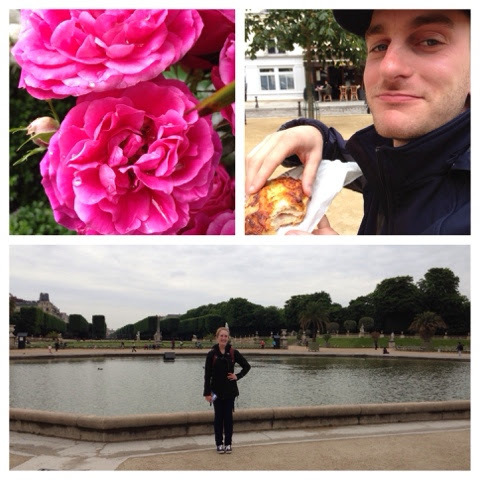 We were a few blocks from the Luxembourg Gardens and within walking distance of Notre Dame. For two recent grads it was also nice being near the universities. It wasn't the most stellar of accommodations, but the room was pretty spacious (it had 3 beds and piano) and we slept pretty well there. 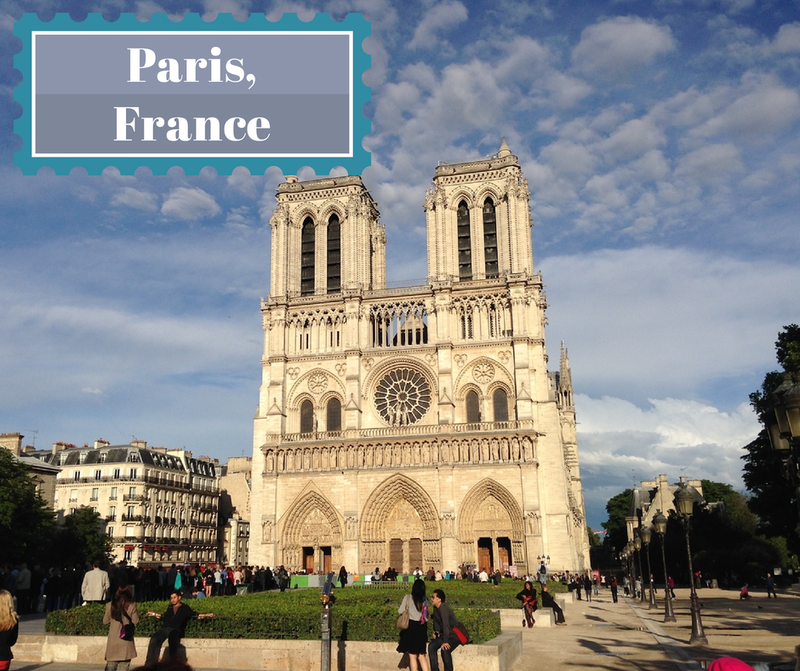 I got a lot of travel information from blogs and the Rick Steves website, but since there was so much to do in Paris, I wanted to get a guide. I found this Lonely Planet one for under <$15 and it was perfect. It was small and light, had a great map, and was perfect for bite-sized information. Because we didn't hire any tour guides, we used this all the time. While in Paris we didn't do any day trips because there was so much to see in Paris. Below is our itinerary. Arrived in Paris by train from Nice, France. Garden Walk from our Pocket Paris guide. During the walk we saw the Luxembourg Gardens, Maché au fleurs, Shakespeare and Company, and Ile St. Louis for their famous Berthilion glacé. Notre Dame---even in the rain there's a line so try to get there early! The Crypts of Notre Dame---cool history of Paris. Lunch at Domaine de Lintillac. Hung out in Jardin des Tuileries to enjoy the flowers and the sunshine. African hot chocolate at Angelina. Shopping for gifts at Carrousel de Louvre. Its underneath the Louvre, also a great place to buy Louvre tickets without having to wait in line. Back to Notre Dame for a Mozart concert. Dinner in the Latin Quarter. Put a love lock on the lock bridge. 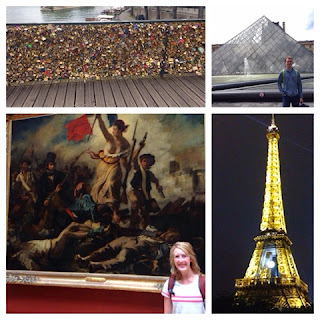 Spent a good portion of the day at The Louvre. Leisurely walked and shopped down the Champs Elysées. Climbed to the top of the Arc de Triomphe. Walked to the Eiffel Tower. Long dinner near the tower outside so that we could see it light up at 10pm. Sacre Coeur-----bad decision. The area around Montmarte was very shady and there were more gypsies at the basilica than our whole trip combined. I would not recommend going here. Lunch in the Opera District. Tour of the Paris Opera House. Le Coup-Chou: We found a recommendation for this in our guidebook and we are so glad that we made a reservation here. 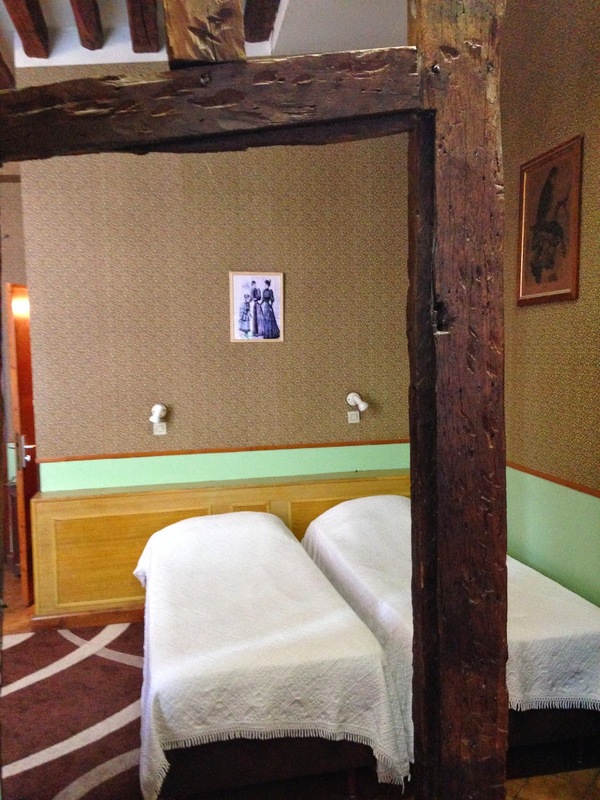 It is in a building dating back to the 14th century with antique furnishings from the 17th century. It has a good deal of candles, old wood, and plays classical music. The atmosphere is very romantic and you couldn't help but feel that you had stepped back in time. I had some fabulous duck with cinnamon apples and a hash-brown-like side. Delicious and a beautiful setting. Domaine de Lintillac: I went to this restaurant 2 years ago during my first time in Paris and took a picture of the sign because it was the best meal I'd ever had. I made it a priority to come back here with Matt. In the 2 years they have completely renovated the inside, but the menu is still the same...all duck! The duck confit is fabulously tender. It falls off the bone and tastes like butter. It is also served with a salad and pomme de terre sarladaises. Champagne is a must. Berthilion glacé: Famous Parisian ice cream. Very fresh and delightful flavors. Angelina: This famous belle-epoque decorated tea room is the perfect place to stop for a fancy dessert. Their African hot chocolate is not to be missed, but best shared with others. It's very rich! Eric Kayser: This artisan bread chain was one of our favorite places. They have cookies, tarts, great sweet breads as well as some fabulous rustic breads. Traveling soon? 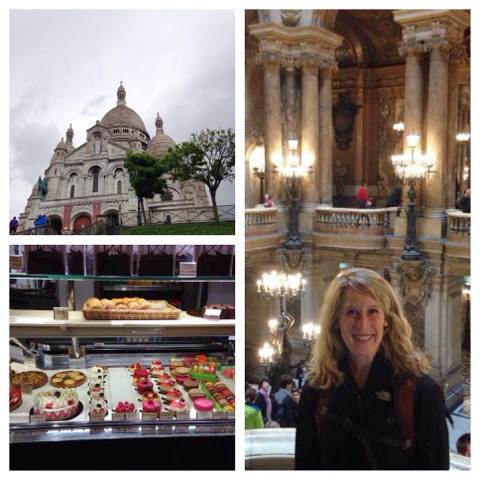 Check out my recent guides to Nice and Geneva. Katy, thank you for writing these helpful reviews! 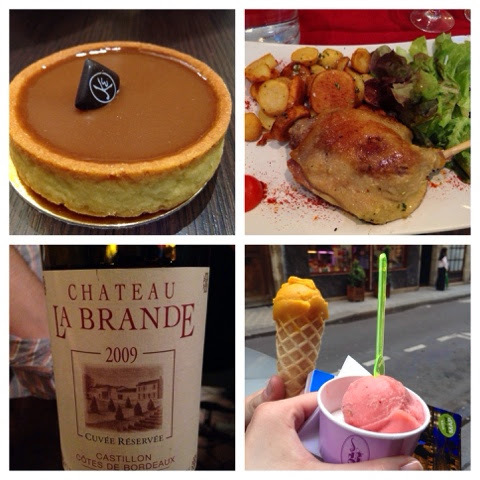 My family and I are traveling to Paris next week and I am excited to check out these spots. Yum! I'm glad I could help. I hope you have a wonderful trip!